Handcrafted using quality natural materials, the Rattan Renoir Hanging Chair from Sika Design will add a touch of bohemian styling to your home. Only suitable to be used indoors; suspend from the ceiling or a beam in the living room, bedroom or conservatory and completely lose yourself in a good book. Pair with complementing cushions and throws to create the ultimate cozy corner to retreat to after a long day. Sourced from Indonesian forests, the lightweight, durable Rattan and unusual nest frame perfectly marry together to create a standout piece of furniture design. Available in 3 gorgeous colours; natural, antique and taupe, there is a Renoir chair to suit your space. Part of the Originals collection from Sika, add other key pieces together to completely transform your home. For other Unique Chairs and Sofas see more here at Cuckooland! Boasting 3 generations of knowledge and expertise, Sika Design create timeless handcrafted rattan furniture for contemporary and traditional homes. First emerging in 1942, Ankjær Andreasen produced the first batch of baskets, lamps, flower tables and other small interior pieces from rush and willow. Later expanding production to include their first series of rattan furniture, Sika Design was firmly established. 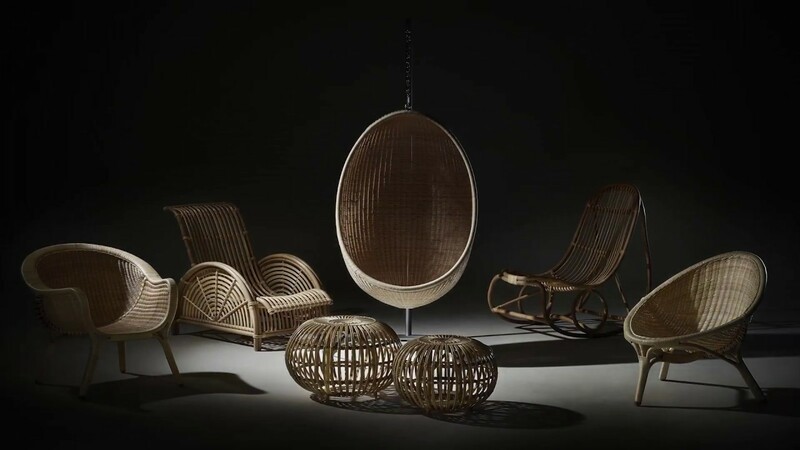 While sourcing rattan from the Far East, the skill of local wicker makers encouraged Andreasen to establish a factory in Malaysia where he later made the decision to start manufacturing their striking designs in Indonesia. Continuing in Ankjær's footsteps, Knud and Louise Andreasen strive to develop and preserve the aesthetic and quality Sika proudly promote. With decades of experience behind them, at every stage of development and production, Sika design ensure each piece of furniture looks and feels exceptional. From sofa benches to hanging nest chairs, their sculptural pieces evoke a feeling of luxury while remaining comfortable and useable. At their core, Sika-Design take effort to respect the environment as well as their workers human rights. With the aim to reduce their consumption of resources and their compliance with standards of social accountability, we here at Cuckooland can really get on board with their forward-thinking attitude. Socially aware, and dedicated to achieving the highest standards, we hope their passion for all things rattan inspires you to transform your home!